Remember those early days of the Internet, when the web was little more than a collection of ugly static pages? It's come a long way since then, but whether it's for a lack of time, resources, or expertise, a lot of nonprofits are still struggling to catch up. Many haven't yet figured out how to harness the power of the Internet to help them tackle the core problems they are trying to solve. When my organization, KaBOOM!, first launched a website in 1996, we followed the norm and used it as a space to share basic information about our mission, strategy, and vision. Essentially, it was an online brochure. But eight years later, we hit an inflection point. After years of double-digit growth leading playground builds across the United States, we realized that we were not growing fast enough to realize our vision--that is, a great place to play within walking distance of every child. We were building hundreds of playgrounds, but we needed to be building thousands. So we got creative. 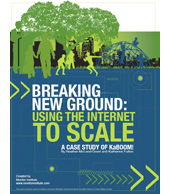 The report released recently by The Monitor Institute, Breaking New Ground: Using the Internet to Scale: A Case History of KaBOOM!, outlines our strategy to give away our non-profit model online for free to empower others to act on our behalf. Our website is now a vibrant, breathing, growing entity that is at the heart of everything we do. In 2009, every dollar we spent on online tools helped to improve 10 times as many neighborhoods as a dollar spent more directly on playground equipment. Online outreach efforts helped people build more than 1,700 do-it-yourself (DIY) playgrounds in communities around the United States last year--almost as many as we have assembled directly during the past 14 years. For us, technology isn't an end in itself, but rather a means to fostering real-world connections and results. 1. Keep it simple & concrete. What do you do, and how do you do it? If you want to use the Internet to empower the general population to replicate your model, the procedures need to be easy to follow and lead to a concrete result. Planning a playground project is no small feat, so in order to "give our model away" to DIY playground builders, we first had to understand, simplify, and codify how we do it. Our online toolkit is one example. It also helps that our DIY builders see a tangible outcome to all their hard work--a gleaming new playground filled with happy children. 2. Treat your online strategy as mission-critical. For us, online is not the icing, but the cake. Putting an online strategy at the core of your organization doesn't have to mean sacrificing offline engagement. In fact, online organizing is one of the main ways we achieve real-world impact. This means dedicating the necessary resources to online strategies, including sufficient staff. We've hired two full time community coordinators to help motivate and engage our registered users. Many nonprofits see online tools as a free or cheap way to get the word out, not understanding that effective online community organizing requires dedicated resources, just as it does offline. The difference is, you have the potential to reach many, many more people, empowering them to act as leaders in their physical communities. 3. Build your own technical competency. If your online strategy is mission-critical, your online tools need to work the way you want them to. For years, we outsourced web development to third-party vendors--a typical approach for many nonprofits, who often feel they lack the expertise or resources to do their own website development. But this was a source of much frustration, and the end result was seldom what we had envisioned. In 2009 we finally hired our first software engineers. How liberating! We now have more control over the technology development process, and we also benefit from constant iteration and rapid learning--a practice common in for-profit, Internet-based companies like Google. 4. Nurture your online community via its leaders.Online tools are only as powerful as the individuals and communities that use them. Many nonprofits and foundations think that if they just invest in building new tools, individuals will find and use them--but it rarely happens this way. Besides dedicating your own staff resources, it's imperative to identify and reach out to the ringleaders in your online community. These are the "super-users," the extra-enthusiastic people who will give your community the vitality and vibrancy it needs to attract new members. Even now, our users don't talk to one another, teach one another, or learn together as much as we'd like them to. This year is about letting the voice of the community, not the organization, dominate the online space. 5. Create incentives for action. People rarely act outside their own self-interest. This can be tough for nonprofits, who are often asking constituencies to take action out of the goodness of their hearts. Even though people are using our online tools to bring a tangible benefit to their community--a playground--self-organizing can still be a high hurdle. A lot of projects in our planner fizzle out. How can we help push these self-organized volunteers thousands of miles away to follow through? We are now developing an online, points-based recognition program to "reward" active volunteers. We have also found that the chance of winning a relatively small prize motivates projects to compete against one another for more progress. 6. Give up credit to increase your impact. Nonprofits might be mission-driven, but we still like to get credit for what we do. Like so many other companies, we at KaBOOM! have worked hard to create a memorable logo and tagline, and we want to put them in front of as many people as possible. Still, we can't lose sight of the fact that our vision is a playground within walking distance of every child--and whether those playgrounds are stamped with the KaBOOM! logo is ultimately irrelevant. Once we found that some partners were turned off by the inclusion of our own brand (or a funder's brand), we started working on true "white label" versions of our tools to ensure the widest possible adoption. 7. Care more about real-world outcomes than online metrics. Online metrics can be addictive. How many site visits, how many Facebook friends, how many Twitter followers? While tracking metrics is an important part of any online strategy, it's really about quality, not quantity. We once set a goal of increasing our site traffic by a factor of 10, but realized that to do that, we would have to focus on "junk traffic"--one-time visitors who leave immediately and never come back. So we instead turned our attention to what we really care about--the number of real-world playgrounds that are built by people using our tools to organize themselves, and the impact of these playgrounds on local children and communities. How has your organization leveraged technology to solve problems? Do you know of other examples of online communities making a real-world impact?